Untreated gingivitis can progress to the point where the gingival attachment fibers to tooth and bone are lost; and beyond that to the point where bone destruction results (Figure 1). This bacterial illness is called periodontal disease (or periodontitis), and is the number one cause of tooth loss in adults. It is also referred to as gum disease and by the antiquated term, pyorrhea. 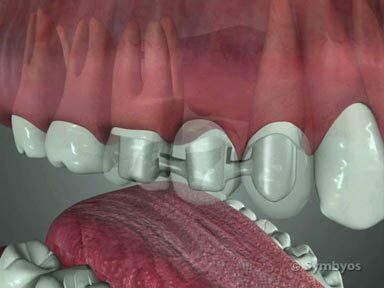 Figure 1: Advanced periodontal disease. If more than 40% of the tooth-supporting (alveolar) bone has been destroyed by periodontal disease, the disease is considered severe, or advanced. Allowing the disease to progress to this point introduces significant general health risks. Periodontitis is not curable, but it can be controlled indefinitely through treatment by a dental professional, excellent home care, and regular follow-up with a general dentist or periodontist. It is important to note that there is evidence that periodontal disease and certain systemic illnesses are related, and that treating periodontal disease in the dentist’s chair before it progresses may prevent expensive medical treatment and life-threatening illness. How does the dentist diagnose Periodontitis? Periodontitis is diagnosed when a breakdown of the periodontal supporting tissues (gums, periodontal ligament and bone) is discovered. Attachment loss is the term used to describe breakdown of the gingival attachment fibers (and in more advanced periodontitis, the periodontal ligament fibers). It is diagnosed by using a periodontal probe to measure the depth of the pocket formed where the teeth emerge from the gums. Early periodontal disease may not be evident on X-ray images (radiographs), even though the bone may be softened by the disease process. Moderate to severe periodontal disease is evident on X-ray images, which show obvious bone loss. A patient with active periodontal disease is diagnosed through the presence of bleeding upon light periodontal probing. The gums may be red to bluish-purple in color at infected sites, and will generally appear puffy due to the presence of fluid in the tissues. Instead of a stippled appearance, the surface of the gums will appear shiny and smooth due to an accumulation of inflammatory fluid. Treatment of periodontal disease may involve scaling, root planing, soft tissue laser debridement, and localized administration of antibiotics. Other treatment may be recommended. Current treatments for periodontal disease are considered non-specific. This means they are not generally targeted at any particular species of periodontal bacteria. 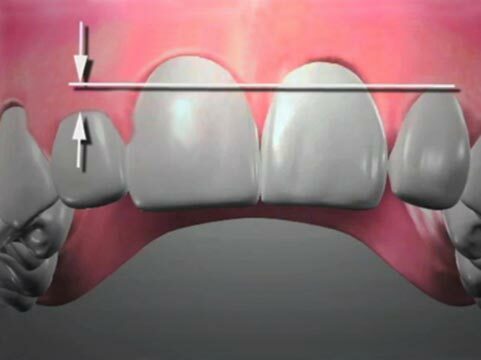 The majority of periodontal treatment consists of mechanically eliminating as many bacteria as possible from the affected periodontal pockets, and thoroughly cleaning the tooth surfaces to eliminate calculus, pits, ledges and other root surface irregularities in which bacteria tend to thrive. This non-specific protocol continues to be practiced because it is currently the most effective way available to treat the illness. Research demonstrates that current periodontal therapy is successful at decreasing inflammation, and improving vascular (blood vessel) health—both locally and systemically. There is significant variability in the success of treatment, because of the lack of certainty about specific causative factors, contributing factors, and host-defense factors. The most important factors in assuring long-term success with periodontal treatment are the patient’s understanding about the significance of their illness, their motivation to prevent its progression and their own oral hygiene efforts to control the disease. Depending on the severity of the periodontitis when diagnosed, treatment options may be surgical or non-surgical. Non-surgical periodontal treatments include scaling and root planing to remove bacterial plaques and calculus, and establish smooth root cementum which is less conducive to bacterial colony formation; localized antibiotic administration, to help eliminate bacteria and the destructive acids and enzymes from sites which continue to be inflamed (some of which are produced by the patient’s immune response); and periodontal splinting, to stabilize loose teeth which have lost a significant amount of bone. When periodontal disease is under control, it is usually necessary to undergo regular periodontal maintenance to prevent progression of the disease. Surgical periodontal treatment may involve open flap curettage (debridement), in which the gums are surgically elevated off of the underlying bone to allow access for specialized cleaning instruments. Unhealthy bone may be removed as part of that procedure, and the gums may be re-positioned to allow the patient and dental professionals better access for cleaning the teeth (known as apical positioning of the gums). For areas of localized periodontal disease, Guided Tissue Regeneration (GTR) may be performed. This generally involves surgical removal of diseased tissue, and placement of bone and/or soft tissue grafts in the affected area. If the gums recede as a result of periodontal disease (or following treatment for it), the dentist may recommend applying topical fluoride gel to the exposed tooth roots, to reduce the chance of developing decay. Exposed tooth roots lack the benefit of a dense enamel covering. Topical fluoride can be applied in the dental office, by the patient at home, or both, depending on the patient’s risk factors for getting gumline cavities. Exposed tooth roots can also be sensitive—especially to temperature changes and sweets. Desensitizing medications can be applied to sensitive teeth, and the dentist may recommend using sensitivity formula toothpaste until symptoms improve. Which dental and medical diagnoses may be related to Periodontitis? Periodontal disease (periodontitis) has been linked to a number of systemic health problems such as strokes and heart attacks. Periodontal disease has been positively associated with certain system-wide illnesses. It is believed that long-standing (chronic) inflammation anywhere in the body (including the mouth) is capable of increasing the production of a substance called C-Reactive Protein (CRP) in the liver and blood vessel walls. Studies have shown elevated levels of CRP to be a greater predictor of heart disease than elevated cholesterol. Other studies suggest that certain bacteria found in the mouth can cause blood vessels to decrease in diameter, imparing blood flow and encouraging clot formation. There are other bacterial illnesses of the mouth, which can produce inflammation of the gums (gingivitis) and tooth decay (also called caries). Untreated gingivitis leads to periodontal disease, and exposure of tooth roots from receded gums may occur (gingival recession). Exposed tooth roots can be very sensitive to temperature changes (dentin hypersensitivity). In teeth which have lost a significant amount of supporting (alveolar) bone, tooth mobility can result. This is known as secondary occlusal trauma. 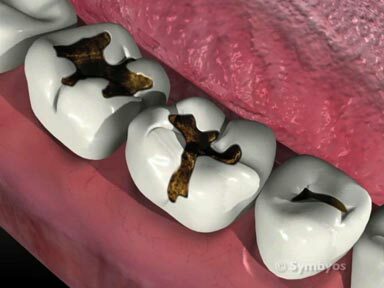 Sometimes bacteria that infect the pockets around teeth will find their way into or under the tooth, causing an abscess. Untreated periodontal disease can result in loss of multiple teeth, a condition known as edentulism. Poorly controlled diabetes is a factor in the progression of periodontal disease, and may also be a contributing factor to development of the disease. Active periodontal disease also contributes to poor control of blood sugar among diabetics.